QMobile brings exceptional Smartphone in reasonable rates for its valued customers. 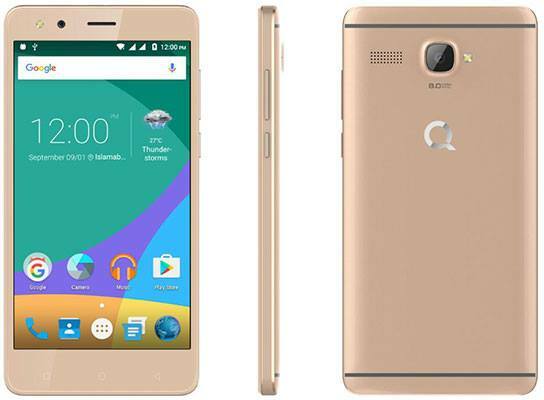 This time it has launched QMobile Noir i5.5 Smartphone with remarkable feature tools. It is mind-blowing hand-set for using with speedy service. Android Marshmallow system is included in this Smartphone and it is also giving Quad-core 1.3 GHz speedy for using speedy cellular facility. Dual SIM option is also available and it provides 1GB RAM feature in this cellular phone. Users can do multiple tasks through this Smartphone with correctly and they don’t get any kind hanging problem while using this hand-set. The camera quality is really exceptional in this cellular phone for using and it has included some latest camera tools for using like Beauty mode, HDR and Touch-focus. Processor: Quad-Core 1.3 GHz and ARM Cortex-A7. Rear Camera: 8.0 mega pixels (LED Flash). Display Colors: IPS HD display. Bluetooth, USB, WLAN and GPRS. 3G Enabled: WCDMA 900 / 2100. Audio: FM Radio, 3.5mm audio jack, MP4, MP3, WAV Player and Other Multi-media players. Battery: 2500 mAh Li-Lon (Removable). Ringtones: Polyphonic ringtones, Downloadable, Sound-recorded and MP3. Other Features: Multi-touch display option, GPS Supported, A-GPS Supported, Speaker-phone, Calendar and Google Maps. Latest Features: 320 dpi, Spread-trum SC7731 Chipset, Beauty mode camera option, HDR camera feature, Proximity sensor, External micro-SD up to 32GB and Acceleration sensor. Available Colors: Grey and Golden. You may also like: QMobile X 700 Pro Lite.